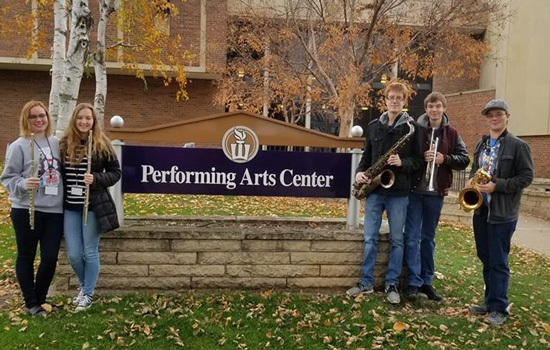 Central High School band members participated in the 41st annual Winona State University Honors Band Festival on Nov. 2 and 3. The honors band is comprised of approx. 100 high school students from Wisconsin and Minnesota. Students are nominated and selected by the WSU faculty. Seven CHS students were selected, but only five were able to attend. Selected were: Hope Caya (flute), Riley Noonan (flute), Kyle Vivian (baritone saxophone), Eric Lehmann (trumpet), Alex Vivian (trumpet), Cameron Lord (trombone), Adam Kordecki (tenor saxophone). Students who attended were: Caya, Noonan, Kyle Vivian, Kordecki and Lehmann. The Honors Band performed a concert along with the WSU Wind Ensemble on Saturday, Nov. 3.